Tackle advanced signs of ageing with a cocktail of powerful, clinically proven ingredients. Pure retinol visibly reduces fine lines and wrinkles, while concentrated Vitamin C brightens dull skin and fades brown spots. Our unique CollagenSupport Complex with hydrating ceramides strengthens the skin's natural barrier, restoring firmer-looking, supple-feeling skin. New to Retinol? Allow your skin to get used to retinol by gradually building up usage of the Clinical 1% Retinol Treatment, starting from three times a week to every other night, then finally each evening as tolerated. Clinical Ceramide-Enriched Firming Moisturizer can be used each night, as it contains a lower percentage of retinol. At night, apply a pea-sized amount of the Clinical 1% Retinol Treatment after cleansing, toning and exfoliating. Follow with the Clinical Ceramide-Enriched Firming Moisturizer. In the morning, always use a broad-spectrum sunscreen rated SPF 30 or greater while using these products. Can I use Clinical 1% Retinol Treatment or Clinical Ceramide-Enriched Firming Moisturizer during pregnancy or breastfeeding? The percentage of retinol in Clinical 1% Retinol Treatment and Clinical Ceramide-Enriched Firming Moisturizer is comparable to the strength of some prescription retinoids (which must not be used during pregnancy or breastfeeding). Because of the relationship between retinol (cosmetic variant of vitamin A) and retinoids, we advise you not to use these products if you are pregnant or breastfeeding, unless your doctor has given explicit permission. Although there is no direct evidence that cosmetic retinol can be harmful, we'd prefer to err on the side of caution. What should I do if my skin reacts strongly to Clinical 1% Retinol Treatment? If your skin reacts strongly (resulting in red, scaly or dry skin) use Clinical 1% Retinol Treatment less frequently or mix one pump of Clinical 1% Retinol Treatment with your favourite Paula's Choice serum, Resist Moisture Renewal Oil Booster or night cream. If your skin continues to react, stop using the product. Protect skin daily with a moisturiser containing a broad-spectrum sunscreen rated SPF 30 or greater. The CollagenSupport Complex in our Clinical Ceramide-Enriched Moisturiser combines the skin-replenishing properties of 5 ceramides with retinol for strengthening support and several forms of vitamin C to help defend against environmental stressors and promote firmer skin. Together, this complex provides the essential building blocks for skin to renew itself and restore its natural barrier. 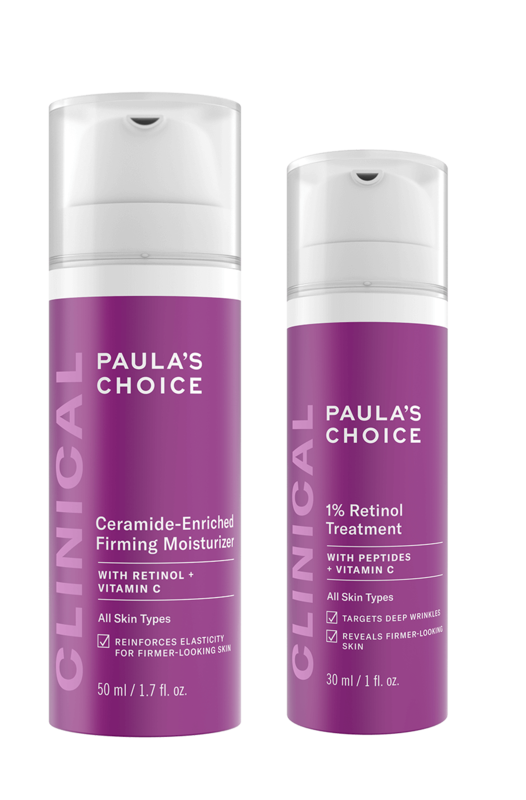 How do Clinical products differ from Resist or other Paula’s Choice Skincare product categories? Clinical products offer enhanced, targeted formulations for specific concerns such as advanced signs of ageing, dehydration or sun damage. Ultimately, it’s a matter of what will suit your needs best. It’s perfectly fine to assemble an anti-ageing routine that mixes Resist, Clinical and any other Paula’s Choice Skincare line that addresses your skin type and concerns. Ceramides are a natural, fundamental part of skin that helps maintain precise levels of hydration, allowing skin to have a smooth, even surface. They’re critical for holding skin together (think bricks and mortar), protecting it from dehydration, signs of sensitivity and environmental damage that chips away at the skin’s protective surface. Ceramides are the most abundant part of skin, making up over 50% of its composition. As we age, the level of ceramides in our skin begins to decrease. As a result, the skin barrier weakens, which can lead to symptoms such as irritation, dryness, and redness. Skincare products that contain ceramides (and other skin beneficial ingredients) can help improve these symptoms.